So earlier this month, Benton has provided this product to me for review purposes. Unfortunately I haven't had the chance to really test it out solidly for an extended period of time so will have to go with a more...first impression/short use type of review. I didn't know this but apparently the name "Benton" was inspired by "The Curious Case of Benjamin Button"; in which I have no watched but get the gist of it where the character gets younger rather than older (?). The philosophy is restoring youth and Benton's skin philosophy is to restore skin back to its original, healthy condition with their ingredients. I've used 2 products from Benton before, one is their Aloe toner and one is their fermentation eye cream. The toner didn't wow me but their eye cream certainly did, so from then I've been on lookouts to try other Benton products. I'm going to start with packaging because I've got the best images for it. So it comes in a box and in the box is a netted bag and the soap itself, which comes in a packet form. I don't think I can ever thank them enough for having that foaming net because not only does the soap bar fit snugly in it, it's super handy to pack it along for travels and hang to dry when you use it. I don't actually have a lot of space in my bathroom so hanging it up was really my only option. Frankly, before the product came, I was really wondering where I can store it, so huge plus with that foaming net! The packaging is simple and the design is simple. The design on the soap is so simple that I just wonder if they're for real, only because so many products on the market is really packaged up. But I'm more about the product than the packaging myself (did I mention how much I like the foaming net though?) so this didn't bother me, even though every time I use it, in my head I think that they could do a little better on the packaging. Because this soap and brand boasts ingredients, of course I should cover it. This bar is made with vegetable base consisting of 8 vegetable oils, honey, oatmeal, cacao seed powder, calamine, papain, basil and chamaecyparis obtusa oil. Benton's sent me tidbits of info regarding these ingredients and thankfully they did because my skincare routine doesn't carry a lot of these ingredients, or natural ingredients for that matter. Essentially this bar is rich in antioxidants, helping to manage sebum and dead skin cells, moisturising, calming and soothing. As such, basically the whole family should be able to use this because of its natural properties and suitability for most, if not all, skin types. Basically, you use it as you would a stick cleanser. Minus the twisting to get the product out. That was it, really. I would recommend having a damp/wet face so this product will get on the skin better, then wet fingers and massage it and it will foam up nicely. There aren't any heavy foams so don't expect anything like bubbles. This is what everyone wants to know, right? Well, this bar is great at cleansing - it's a great 2nd step cleanser and even with water it doesn't generate huge amount of bubbles, and that's how you know that it's natural as a lot of products have bubbling chemicals added to them to make them lather better. None of this here. This bar goes on smooth on wet/damp skin and it smells mildly of lavender - which is a soothing smell. Although personally I would prefer rose. 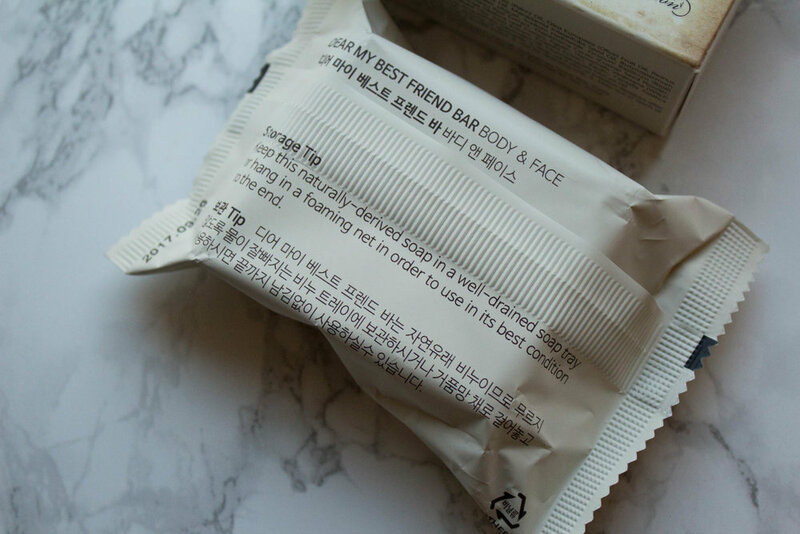 You don't need a huge amount on your face, but I do find that for me to feel like I have the product on, I have to go over my face with this bar several times to get that feeling, especially when you have dry skin so please use on wet skin. 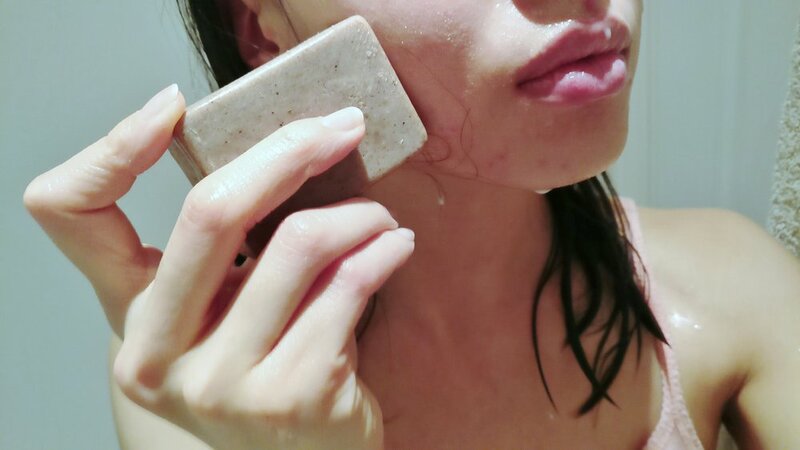 The best thing about this bar is that it makes your skin feel squeaky clean as a second step cleanser, but without stripping moisture - my skin doesn't feel tight after washing/rinsing, which occurs sometimes, and it doesn't feel irritated. There have been a few people who feel this is harsher on their skin, but it seems to have worked just fine with mine, even though I have sensitive, acne prone, and combination (oily) skin type. Perhaps it's the sebum that makes the experience different because there are multiple ingredients in that list that helps with controlling sebum. With the short period of time I've been using this, I feel like it has helped with brightening, soothing and calming the skin down from a long day of work and polluted air. Has it helped my acne though? I'm genuinely not quite sure. It's hard to pinpoint that this product has improved because I use a lot of other products that I know will help during my break outs. I'm definitely interested to see how my skin will change through long term use and this bar of soap seems like it will last for a while! I quite like this bar soap for the face. I'm not gonna lie, I've never been really keen on bar soaps because they seemed like such a hassle, but this one has taught me that it doesn't have to be the case, and I'm already using similar products like stick cleansers. My favourite thing about this product is how it leaves the skin feeling - no joke, my skin does feel soft and stayed hydrated with makeup removal and double cleansing. Natural products have not traditionally worked well on my skin (it loves that chemical stuff!) and I'm not an advocate of natural products, but if you are, then this bar is for you. This bar just contains so many natural oils, herbs and fruit extracts that helps the skin. I can't say much about turning back time with this product, but it really is a lovely product to have and use; and the fact that you can double this up as a body soap though is always a plus! In fact I feel that I neglect my body when it comes to skincare, I would consider using this bar soap when my current soap is finished. The danger of leaving this unhung in the shower is the constant dripping of water will erode it. Unless you put it in the foaming net....!!! Hope this helped, if you have questions, please comment below or find me on isnta @jaye.hicks, and I shall try my best to answer questions! Do you also have this bar? If so, how do you find it?